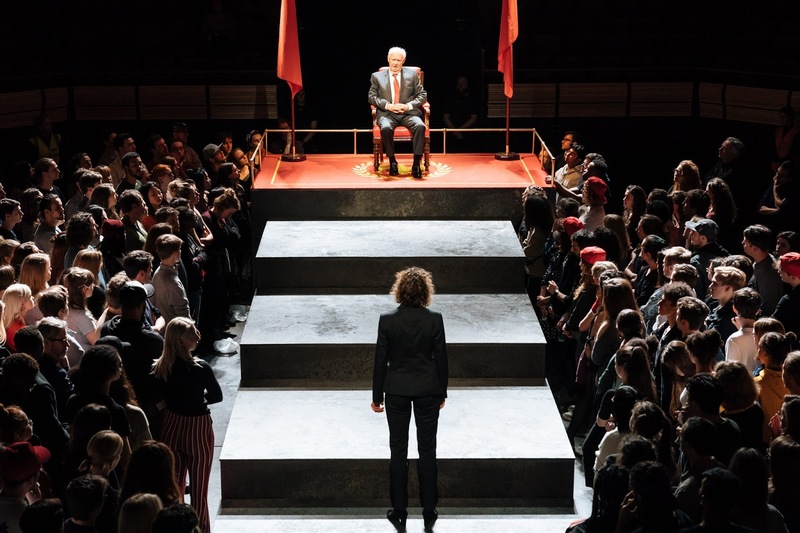 One of Shakespeare’s most famous Roman tragedies is brought crashing into the 21st century in Nicholas Hytner's production of Julius Caesar at the Bridge Theatre. Hytner‘s production is staged in the round, with some audience members seated and some acting as the mob. Pre-show, throngs of audience members are packed into the vast auditorium where a rock band decked out in Caesar’s merch is playing covers of popular music. The crowd yells along to We’re Not Gonna Take It by Twisted Sister, and egged on by the swelling, baulking and jostling, it’s impossible not to be swept up in the hysteria of the rally. The mob mentality which plays such a large part in the story of Julius Caesar is almost instantaneously established, and from that moment onwards the rabble is primed to go along with anything they are asked to do. Designer Bunny Christie has achieved something remarkable in her production design, which raises the modern day pseudo Rome from the ground. Notably, at one point a gigantic red cloth is passed over the heads of the crowd and set down on the floor, its vivid hue juxtaposing the grim grey tones which dominate the early sets and costumes, and foreshadowing the conspirators' bloody deeds. As the titular tyrant David Calder is an interesting presence. Despite the obvious parallels between the text and the events of the present day, as well as his entourage of baseball cap wearing lackeys, Calder's Caesar bears very few similarities to his obvious real world equal. It’s interesting to see Caesar take centre stage though, as although Cassius describes him as a Colossus, in many productions Caesar seems like an afterthought in the play which takes his name as its title. Calder’s Caesar is perfectly pitched as the dictator on the rise. Externally, he’s jovial enough to begin with, all smiles and handshakes, but there’s a severity hiding beneath the surface too. One which Cassius urges Brutus to topple. Oh, and what a pair Cassius and Brutus are. Even when there’s action going on elsewhere, Michelle Fairley and Ben Whishaw’s duo of reluctantly murderous idealists are impossible to turn away from, even for a second. 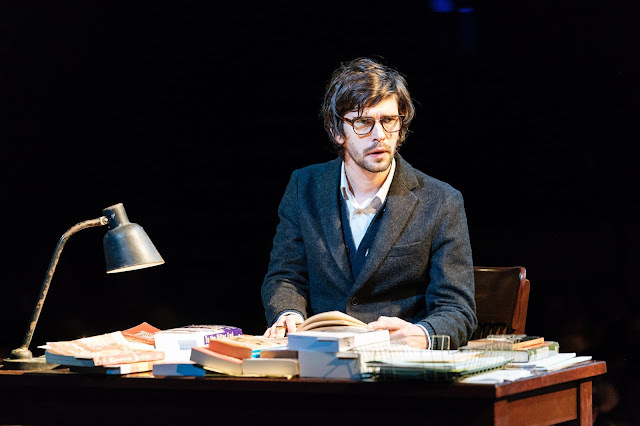 Ben Whishaw is a cerebral Brutus, more at home in his study than on the battlefield. Nevertheless, he has a certain charm and persuasiveness. He's a thinker, a schemer, the perfect opponent for Calder's exhibitionist Caesar. Meanwhile Michelle Fairley's steely Cassius brings grit and tenacity, which compliments Whishaw's febrile energy wonderfully. As Brutus and Cassius’ plot to seize power very rapidly start to come apart at the seams, their downfall is mirrored in the deconstruction of the once spotless set. Rubble falls from the ceiling and Pro-Caesar propaganda is trampled into the ground. The final act of Hytner’s masterpiece is staged in an all-out war zone. Bodies are left where they fall, and there are a lot of them (this is a Shakespearean tragedy, after all), and impressively in the intimate final scenes where the conspirators reflect on their actions, the pressing mob which surrounds them on all sides, made up of actors, ushers and slightly shell-shocked audience members, settles silently. They’re almost as resigned as the characters are as they’re brought face to face with the destruction they were complicit to. As the dust settles and the actors bow and exit, the audience can finally breathe a sigh of relief and consider the ride they’ve just been on. Amid the hysteria of the crowd, Hytner’s brisk two hour cut of Julius Caesar feels monumental. Almost immediately one starts to wonder if he might consider following up his triumphant Julius Caesar with Antony and Cleopatra. It’d certainly be a treat to see David Morrissey take on the legendary General a few more years down the line. If there’s anyone out there who still rejects the idea of taking Shakespeare’s plays out of their original historical context then they must get a ticket to this frankly epic production.